Shares of Mahindra & Mahindra (M&M) hit a 52-week low of Rs 661 per share, down 3 per cent on the National Stock Exchange (NSE) in early morning trade on Monday after the management revised its tractor volume guidance lower to 10 per cent from earlier lower band of 12-14 per cent. It also expects FY20 tractor growth to be in single digits. The passenger vehicles industry is expected to grow at around 5-6 per cent in FY19. M&M has posted 60 per cent year-on-year (Y-o-Y) growth in net profit at Rs 1,476 crore in December 2018 quarter (Q3FY19) against Rs 920 crore in year ago quarter. The revenues grew 12 per cent at Rs 12,892 crore in Q3FY19 against Rs 11,491 crore in Q3FY18. 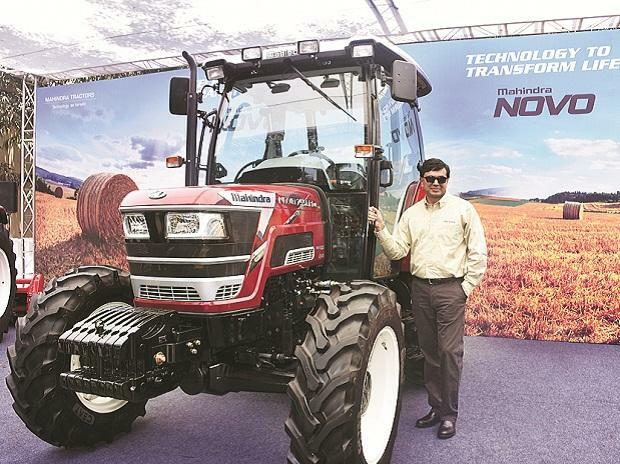 The earnings were boosted by robust growth in tractors even as higher raw material expenses and high discounts in passenger vehicles and lower commercial vehicles sales weighed on its margins. The company’s operating profit margin (OPM) margin lower by 150 basis points at 13.2 per cent during the quarter against previous year of 14.7 per cent on account of commodity cost pressure, higher discounts and new launch expenses. M&M said the de-growth in the MHCV industry is primarily due to the implementation of new axle loading norms, which has created surplus capacity in the short term, resulting in reduction or temporary suspension of fleet purchase plans by transporters. Passenger vehicle sales for the festive season (September + October + November) were not up to industry expectation primarily due to softening of urban demand. The urban sentiment was subdued largely on account of an uncertain economic scenario arising from the dollar rate movement, fuel prices and stock market performance. Analysts at Elara Capital believe M&M’s UVs volume growth to accelerate with the recent launches and upcoming XUV 300 in Q4FY19. While the UV portfolio is subdued till now, we are impressed with the LCV, M&HCV, 3W and export segments which have pulled up the year-to-date (YTD) FY19 total automotive volume growth to 13%, despite UV growth being flat. “We remain cautious on the tractor growth outlook for FY20-21E owing to cyclicality and have assumed a 4% CAGR over FY20-21E. While we are impressed by the fit-and-finish and features of XUV 300, pricing would remain key for its success initially, thereby impacting margins in short term,” the brokerage firm said in result update. “We believe that over the medium term with some of the headwinds faced in Q3 like higher oil prices, exchange rates, commodity costs and interest rates reversing, consumer sentiment should reverse and PV industry growth should reverse to high single digits as opposed to the 4- 6 per cent expected in FY19. M&M is well placed to capitalize on this opportunity with a strong product portfolio post the launches of Marazzo and the XUV 300. XUV 300 has the potential to add around 5-6k/month in the medium term to the existing run rate of around 20k/month although there will be some cannibalization,” analysts at Antique Stock Broking said in result review.